All sleeping masks look the same to the people wearing them, but what about from the outside? 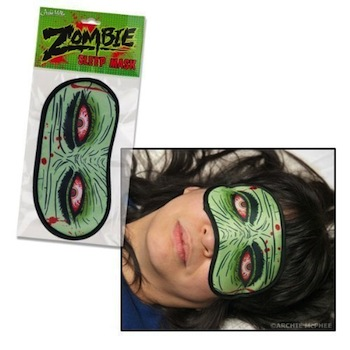 This Zombie Sleep Mask makes you look like a brain-hungry, undead creature. Surely, that will make your family leave you alone for a little peace and quiet! Perfect for taking a nap during a zombie walk. Polyester with cotton back and elastic band. Fits most heads.